Sammy has been found! Somehow our front door blew open yesterday while we were out of the house and he went on an adventure (and Tuendi, Harley, and Dove stayed put by some miracle!). It turns out that the husband of the Glenville Clerk of Court is running for office and going door to door in our neighborhood. When he got to our house, Tuendi barked at him from the kitchen and our front door was wide open, so he called the police. The police officer and the animal control officer compared notes (only in a small town!) and realized that the stray they'd picked up earlier in the day was the same type of dog as the one in the house with the blown-open-door. So when we woke up this morning there was a note from the police officer wedged into the front door saying Sammy was at animal control. This is yet another reason why I love living in Scotia. In small towns, people care. 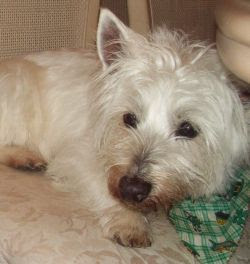 He is a senior West Highland Terrier, wearing a black collar with silver studs, has solid white, shaggy fur, and weighs approximately 20 lbs. He needs medicine urgently! He is microchipped but isn't wearing tags. congratulations! what a relief. so glad to hear he was found and properly identified so quickly and easily.